Hunter, an energetic and athletic young boy, enjoyed spending time with friends and playing sports, but one day, his life changed in an instant. At just 11 years old he had a stroke. The stroke damaged an area in the left temporal lobe of his brain which caused him to have speech, memory, and learning delays. The damage also caused him to start having seizures. When the seizures began, even with the help of medicine, they were difficult to control. Hunter had no warning before the seizures occurred, so he would often fall and hurt himself, resulting in numerous injuries and stitches. He had to quit sports because the seizures were too frequent. A family member had to stay with Hunter at all times, even sleep with him at night, just in case a seizure occurred and he suffered an injury or needed emergency medicine. He had a bad seizure in the shower and had to begin showering with the door open. Classmates were afraid to be around him after witnessing his seizure activity. Hunter went from living a “normal” active life to a life with no privacy, no independence, and numerous hospital visits. Hunter wanted freedom and his parents knew their son could not continue living life in this manner. They wanted him to finish school with his classmates. 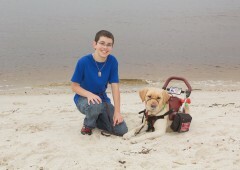 His mom thought a service dog could warn Hunter before a seizure and then he could sit down and prevent injuries. She spent hours on the internet researching service dogs and eventually found CPL. Two years ago, Hunter was introduced to Argos, a handsome Yellow Labrador, during the kickoff dinner of Team Training. Hunter immediately fell in love with Argos and sat on the floor the entire evening with his new dog in his arms. Once the training began, it was challenging for Hunter. 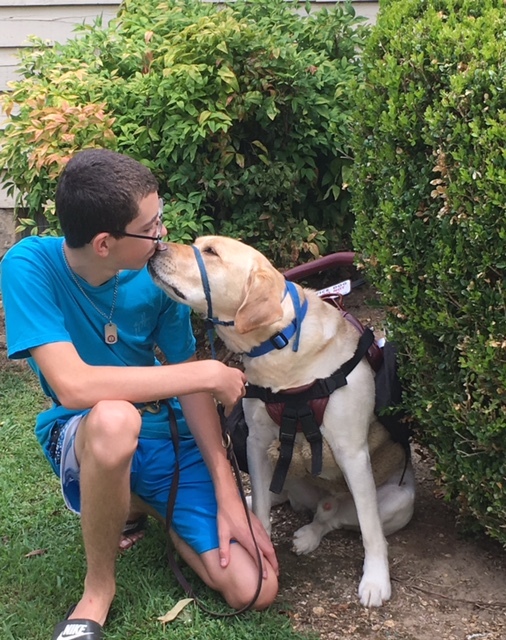 At just 13 years old, he had to retain copious amounts of information about service dogs, training methods, health and wellness, public access rights, and much more. But Argos began to alert to Hunter’s seizures right away and it was during training that Hunter and his mom knew they had made the right decision to receive a service dog through CPL. Argos alerts about 5 minutes before each seizure occurs. He will rub his entire face on Hunter’s thigh and will not stop until Hunter sits down. If the seizure is at night, Argos will lick Hunter’s face attempting to wake him up. If Hunter does not wake up, Argos will go down the hall and wake Hunter’s mom. One of Hunter’s most memorable moments with Argos was during a hospital stay at Scottish Rite Children’s Hospital. Argos could tell Hunter was sick and would not leave his side. After having a bad seizure, Hunter woke up and Argos’s face was the first thing he saw. That was all Hunter needed. He hugged his dog and didn’t need to talk. Argos comforted him. Thanks to the advance warning before seizures, Hunter has regained his independence and has his privacy back, something every teenager needs. Hunter taught Argos to “get mom” or “get dad” so he can be alone but still get help if he needs it. Argos sleeps with Hunter so a family member doesn’t have to. Hunter is able to shower with the door closed because Argos lays outside the shower, constantly sticking his head behind the shower curtain to make sure he is ok. He has sleepovers at his friend’s houses and participates in FFA at school. The two have attended an Atlanta Falcons game (thanks to Georgia Make-A-Wish) and they even traveled from Georgia to his grandmother’s house in Punta Gorda, Florida without his parents, something Hunter would have never be able to do without Argos.